i’ve mentioned before how why we love austin has been the catalyst for creating conversation and sparking inspiration between persons it brings together. case in point, mr drew edwards, aka the halloween man. over the years, i’ve had the opportunity to help promote different halloween man productions (punk rock vs rockabilly, shock hop, prom:1959), and as a result, gotten to know and deeply respect Drew. so, it is with great pleasure, i formally introduce you to the Halloween Man. why and when did you create the Halloween Man? I’ve always loved monsters, so I wanted to tell a story where the monster was the good guy and got the girl. It always bothered me at the end of Creature from the Black Lagoon that the Gill-Man got shot. It went the same for King Kong and a lot of other monster movies. So, essentially it first grew out of a desire to correct that. 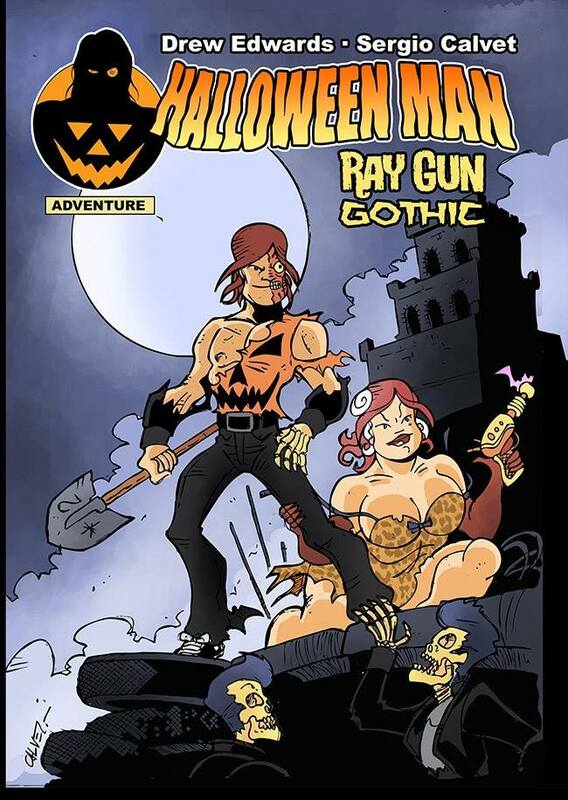 I first created Halloween Man when I was around 18 or 19. I was fresh out of high school and just moved from my small hometown of Possum Kingdom, Texas to the big city of Dallas. Halloween Man was sort of the end result of everything I grew up loving. There was bits of the Universal Monsters, Romero zombie movies, Ghostbusters, Atomic Era sci/fi, and a whole lotta love for silver age Marvel comics like The Fantastic Four. About a year or so into the development stage, it took on a much deeper meaning. I was in a car accident that killed my twin brother, Ben. It’s hard to put it into exact words, but that accident and that loss changed me in ways that continue to effect my day to day life to still. The mental illness that resulted was and is, invisible to most people, but the weight I carry from it is a constant challenge. At the risk of sounding ostentatious, I understand what it’s like to feel like a monster. That sense of otherness and being apart from the rest of humanity, is something I write about from experience. Halloween Man became more than just pulp fantasy, it became the way I coped with the loss and insanity. People have often remarked that the comic is odd, even zany yet has this sense of earnestness. But I guess that’s just the way I see the world around me. when were you introduced to comics? I can’t possibly remember the exact age, but fairly young. The library in my hometown had these huge hard bound volumes of comics from the 1930’s through the 60’s. I used to ride my bike up and spend the afternoons reading through them. Much of my love of vintage comics comes from this point in my life. As noted, I was really drawn into the fantasy world of early Marvel comics. i read in Jamie’s [Drew’s wife] foreword that inspiration for your comics comes from real life. is that conscience or part of the magic of the intuitive creative process? where else do you draw inspiration from? Well, it’s both. As a writer, you’re always looking around you and taking in the world. So to that effect, your life will mold your fiction. A lot of the times, you will actively make the choice of reflecting on your life in writing. But other times, it will just sink in. For example, during my brief time in Las Vegas, my writing took on a much bleaker tone. I wasn’t aiming for that, but that is how I felt inside. So, it just kind of came out. “Halloween Man vs. the Invisible Man” is something I wrote during that time period that I’m very proud of, but that was a hard time for me. As far as other sources of inspiration, I’m a fairly big music fan. Music is almost always playing while I write. Certain kinds of music help me get into the heads of certain characters or settings. When I’m writing specifically for Solomon/Halloween Man I tend to listen to a lot of roots rock, country, and bluegrass. Lucy scenes lean towards things like Etta James or some really brassy vintage R&B. For moody stuff, I tend to break out synth-pop a lot, since that seems to get me where I need to be. It’s about getting into that zone and the right music can get me there pretty quickly. what is the process for writing a comic? Comics are written in script form, much like a play or film. You write out each panel, describe the action of the panel,then write the dialogue that goes into the word bubbles. I think a lot of people are surprised at how many hands actually work on a comic and how much work goes into producting it. Most people seem to think it’s just the artist and that’s it. Your average comic has four or five people involved with creating it. My writing process might seem unstructured to some. I typically get the germ of an idea and let it cook for a few weeks in my head first. Since I think very visually, I then start gathering references from various photos or movies. It helps me focus in on the idea. Once I get to that point, I normally either hole up at a coffee shop or a quiet spot in my home and have at it. Unlike a lot of writers, I don’t tend to go through a lot of drafts. I tend to do a rough in one fevered go, go back briefly for a second draft, then pass it onto my editor Russell. We work on the revisions together normally. My style is very punk rock I guess, probably because I’ve had very little formal training compared to other professional writers. I’m just “1234” let’s go! I don’t want to be academic or polished, I want to get the passion of the moment. Only in recent years have I even started to use test readers, which is a common practice for a lot of other writers. how long does it generally take you to complete? Depends on the the length of the story. I can rough out a simple 24 page comic in an afternoon, but something longer and more complex can take weeks, even months. A multi-issue story arc can become extremely time consuming and that’s just the time I spend on it. Once you can factor in the time spent by the other members of the creative team, a whole storyarc can take up to a year to finish. That’s why you do your best to plan ahead and use your time wisely. Without a doubt, my all-time favorite comic book artist is the late great Jack “King” Kirby. I’m actually looking over at a hardbound copy of his “Challengers of the Unknown” as I type this. My favorite living comic book artist is probably Darwyn Cooke, I would love to have him draw an issue of Halloween Man some day. His “New Frontier” series is a modern classic in my opinion. 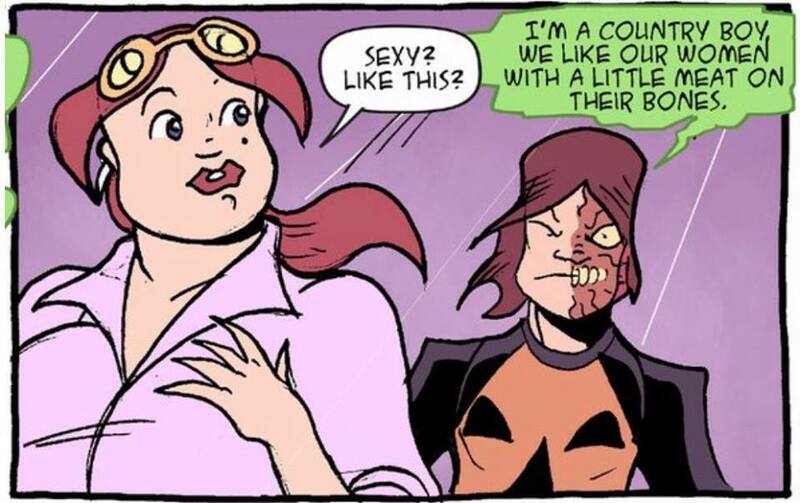 In regards to Halloween Man artists, I’m not sure I could pick an outright favorite. I’ve been very blessed to work with a lot of great artists on Halloween Man. Some of them, like Nicola Scott have gone on to do great things in the comic book industry. That’s something I’m very proud of. 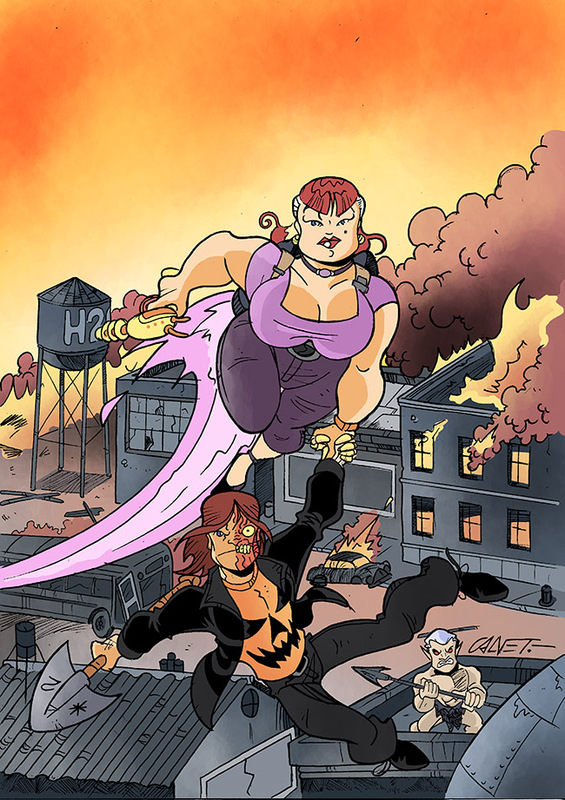 That being said, my longest and most fruitful collabaration with an artist has been with Sergio Calvet, who has drawn more Halloween Man stories than anyone else. It’s funny how the internet has changed how we work with one another. Sergio lives in Spain and I’ve never even been in the same room as him. Yet I consider him to be like a brother. His art has breathed life into so many of my words. future plans for Halloween Man? 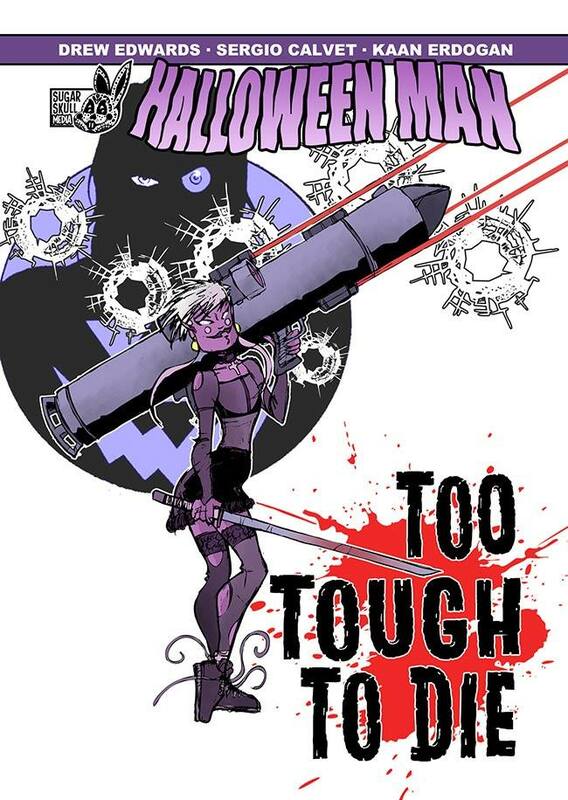 In the direct pipeline, we have our second giant sized Halloween issue celebrating the 15th anniversary of the comic. It’s going to have three all new stories, plus a collection of “greatest hits” from our web comic days. In 2016, we will be ending the ongoing series with issue 13 and restructuring the comic to be done as a series of specials, mini-series, and one-shots. The process of doing a monthly comic is extremely grueling and I’d rather be able to focus on putting out high quality work, than keeping up with that monthly time table. 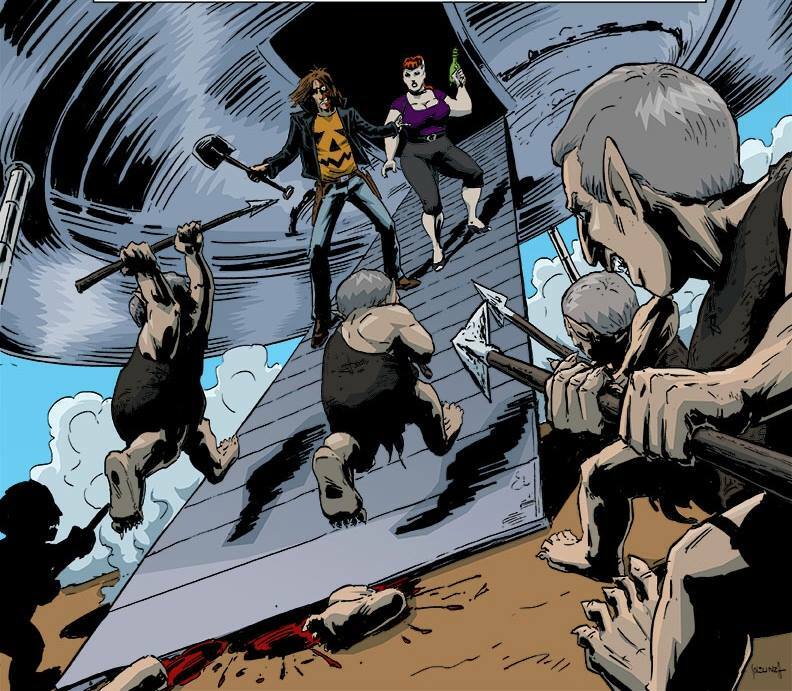 Other stuff coming up is a one-shot centered on Halloween Man’s ever popular, super-scientist girlfriend Lucy Chaplin, an election special, and a mini-series that is a tribute to the late, great Ray Harryhausen, whose films have had a profound effect on me. Austin saved my life! When I first came to Austin, I literally had nothing. My first marriage was ending, so I was fleeing Las Vegas and returning to Texas. I basically had nothing but the clothes on my back and what belongings I could fit into the back of my Jeep. I was crushed and feeling very, very defeated by life. I hit rock bottom when I found myself in a mental hospital and I just remember looking out the window of my room at the city. It was raining and the whole thing felt so dramatic. Corny as it sounds, something about glancing out the window that day made me resolve to get my life back in order. A week or so later, I was released and I think that’s really when I embraced Austin for the first time. Since then, the city has really given me everything I need. Friends, a job, and most importantly love. Because I certainly never would have found my wife Jamie without SXSW. I remember walking into what was then Headhunters on Red River and seeing this very glamourous woman in the middle of this dive bar. It was St. Patrick’s Day and I had actually just sworn off dating, but none of that mattered, because I was transfixed. I wanted to go talk to her, but she beat me to it and I knew instantly that this was a very different kind of woman than what I was used to. She was just so bold. My second surprise was when she excused herself from the conversation and got up on stage and started rocking. She was the lead singer of Punk Blues Review, the band my friends had told me to come check out. “It’s right up your alley” they said. They didn’t know how right they were, because three years later she became my wife. I know it’s become kind of hip to dog Austin because of her expansion and all of the people moving here. But I can’t really fault people for falling in love with city, because I did the same thing. I love Austin and I really feel like my life didn’t hit high gear untill I moved here. Even if I were to move somewhere else, Austin will always have a huge role in my life’s narrative. I will always love this city. Or, check us out on Comixology!